The Grass Roots is an American rock band that charted frequently between 1966 and 1975. It was originally the creation of Lou Adler and songwriting duo P. F. Sloan and Steve Barri. In their career, they achieved two gold albums, one gold single and charted singles a total of 21 times. Among their charting singles, they achieved Top 10 three times, Top 20 three times and Top 40 eight times. They have sold over twenty million records worldwide. Currently, band members chosen by Grill are carrying on the legacy of the group with nationwide live performances. The Buckinghams from Chicago’s Holiday Ballroom to America’s living room on The Ed Sullivan Show, across the USA and in the White House, The Buckinghams have stayed true to their Chicago roots. 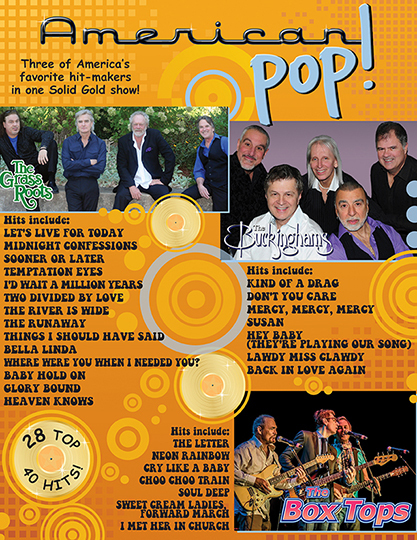 Audiences and critics have affirmed the demand for the music of The Buckinghams, proving that success is sweeter the second time around. Original founding members Carl Giammarese and Nick Fortuna continue to deliver a powerful replay of their hits and solid gold memories. 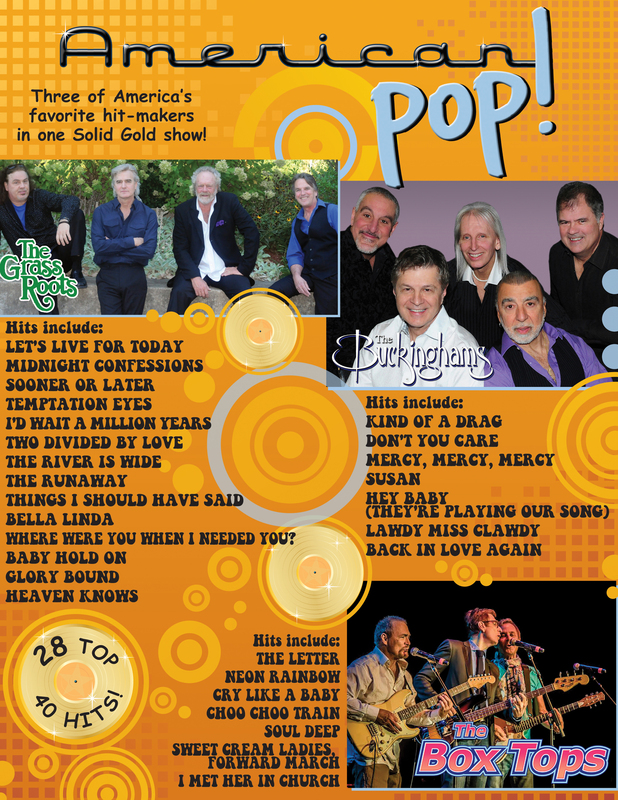 The Box Tops Memphis style Blue Eyed Soul brought to you, featuring founding members BILL CUNNINGHAM & GARY TALLEY. You can feel that gentle southern breeze & smell the smoky barbecue as if you are walking down Beale Street to the beat of their sweet, sensuous, slightly gritty sounds.